Mississippi’s 2014 Primary Elections are Tuesday, June 3rd. 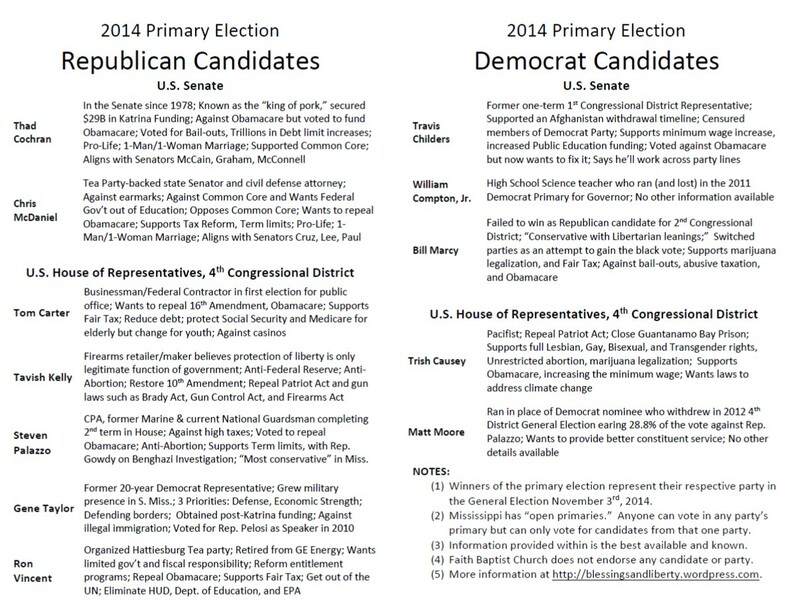 Below is the 2014 Primary Candidate Information sheet that was enclosed with the Faith Baptist Church Bulletin this morning. There was at least one location that truncated some candidate information so it is re-posted below. Click 2014 Primary Election Candidate Information for a full resolution version suitable for printing. The information was collected primarily from the candidates’ own websites, voting records, and news articles that have been linked to throughout The Blessings of Liberty. Faith Baptist Church does not endorse any candidate. With the Mississippi Primary Elections one week away, candidates will be extra busy getting their messages out. The race for the state’s 4th Congressional District has been overshadowed by the negative and heated race for U.S. Senate. However, the two favorites, Steven Palazzo and Gene Taylor, appear to be in a close race as well. Taylor continues to bash Palazzo for his support of Biggert-Waters Act (which reformed flood insurance), voting against Hurricane Sandy Relief, while blaming him for recent defense cuts and a failure to hold town hall meetings. Taylor emphasizes that he has always had traditional Mississippi values and that his party change only reflects that the Democrat Party left him, not the other way around. Palazzo has been running on his record that earned him recognition as the most conservative member of the U.S. Congress from Mississippi. Meanwhile, he has been busy painting Taylor as a liberal Democrat who supported Rep. Nancy Pelosi (D-CA), voted countless times for trillions in spending and the liberal agenda, and switched parties only because Democrats are not electable in the state. In what likely amounts to an inconsequential race, Democrats Matt Moore and Trish Causey have been pushing their agendas of LGBT and women’s rights, equal pay. From the Sun Herald’s May 8th edition of “Around South Mississippi,” Gene Taylor said he declined an offer from Republican opponent Tom Carter to debate. “I think he sent it to the wrong guy,” said Taylor. Taylor has been repeatedly been calling for a debate with incumbent Rep. Steven Palazzo who was unavailable due to the U.S. House of Representatives being in session. Gene Taylor was interviewed by Tuesday morning on WDAM’s News 7 Sunrise program. During the 5-1/2 minute interview Taylor accused incumbent Rep. Steven Palazzo of supporting a cut in Defense spending and unlimited increases in flood insurance rates. Taylor took credit for getting mine-resistant, ambush-protected vehicles to the troops, and over $21 Billion for post-Katrina relief. Saying the cuts in Defense will directly hurt Camp Shelby, Keesler AFB, the Gulfport Seabee Base, and Huntington-Ingalls Shipyard, the cuts will ultimately hurt our nation’s security. Taylor thinks that Palazzo’s public outreach has been weak and vows to do a better job. If voted back into office, he’ll restart townhall meetings, work with local industries, restore confidence in government, and read the bills (inferring that Rep. Palazzo does or did not). For the entire interview, click WDAM News 7 Sunrise.